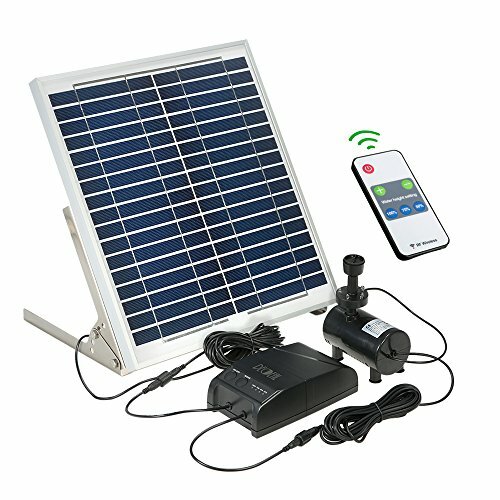 Decdeal Solar Power Fountain 15W Solar Panel + 3.6W Brushless Water Pump Kit with Remote Control | Fountain City Art Ctr. * Please install the product under the environment with sufficient sunlight, especially the solar panel. * When switch on the power, it will activate the circuit under sunlight; after activated, the default state of pump is ON. * If the battery power is completely discharged up, charge it under the sunlight; and the system will automatically turn on when the battery power is about 50%. * Always keep the pump under the water surface and change water frequently to keep water clean to avoid any dirt to impede the pump. * Be careful to protect the solar panel to avoid damage, keep the surface clean constantly. Solar power fountain with storage battery, no need external power supply. DC 7-12V brushless water pump, pump water easily. Max. flow rate: 500L/H; water height can be adjusted from 40-150cm. Remote control can turn on/off the water pump and adjust the height conveniently. Waterproof 5 LEDs with white light.